The federal conspiracy statute, 18. U.S.C. 371 is the staple of federal prosecutors in most criminal cases that involve more than one defendant. In a very simple way, federal conspiracy is an agreement between several persons to commit any federal crime, sort of a partnership in criminal purposes. The conspiracy charge is widely used in all sorts of federal prosecutions, from narcotics distribution crimes to white-collar fraud crimes. It is relatively easy for the government to prove that conspiracy took place because the statute does not require that the substantive crime was actually committed, only that there was an agreement to commit the crime. What’s more, the conspiracy charge will stand even if it was impossible for co-conspirators to commit the crime. But the most dangerous and over-reaching feature of the federal conspiracy statute is that it punishes a person for the criminal actions of all members of the conspiracy, even if the defendant had no knowledge of them. By way of an example, a defendant agrees with a co-defendant to distribute 1 kilo of narcotics, being unaware that the co-defendant is part of a larger conspiracy to distribute 500 kilos. The defendant could be held liable for the actions of the entire group and be charged with conspiracy to distribute 500 kilos. Of course, there could be strong and successful defenses to a conspiracy charge. 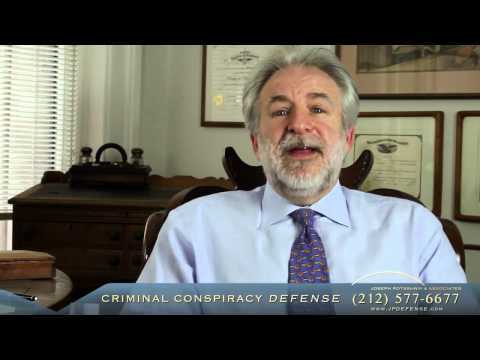 One of the best criminal defenses an attorney in NYC can use is lack of agreement. Simple knowledge or association, or even presence is not enough to prove that there was agreement. Multiple Conspiracies – if the government alleges a single conspiracy it may be possible to argue that the evidence shows two or more conspiracies that result in a prejudicial variance between the indictment and the proof the government provided. In other words, if the indictment only has one conspiracy but the proof showed two or more, the defendant could be unfairly convicted of the crime he was not charged with. Insufficient Evidence – the argument that evidence produced at trial is not sufficient enough to convince the jury that conspiracy actually occurred. In determining whether the evidence is sufficient, the court must view the facts and draw all reasonable inferences from them in the light most favorable to the government. This is not an easy argument to win but it could be done. Withdrawal from the conspiracy – If the defendant withdrew from the criminal conspiracy, it can be a successful defense against the actual conspiracy charge as well as the substantive crimes which were the objects of the conspiracy (such as a scheme to defraud, mail and wire fraud, etc.) To show real withdrawal, the defendant must show more than the fact that he stopped acting as part of the conspiracy; an affirmative act is required, something that can be viewed as decisive and positive step to removing yourself from the conspiracy. Statue of Limitations – in most federal criminal cases there is a five-year limitation period for most cases unless stated otherwise. Major frauds have a 7-year limitation period but many have a 10-year period, which includes most major financial crimes. Criminal tax charges limitation ranges from three to six years. The limitation period begins to run from when the crime is completed. In conspiracy cases, it begins to run from when the conspiracy ended. Legal Impossibility – this defense applies where the defendant agreed with other to do something that is not a crime. Lack of intent/mistake of fact – Not any conduct is criminal, and in order to prove that the defendant actually entered an agreement to commit a crime, the government must prove that the person has the same mental state as the underlying substantive crime. Defending against federal conspiracy charges requires a good grasp of federal law and federal criminal procedure, which is drastically different from state criminal practice. Most criminal attorneys have rarely if ever handled federal cases and don’t have the experience to represent clients in federal courts. We believe that the most effective way to find the best criminal attorney is to interview the attorney in person. Don’t rely on the Internet alone. We suggest meeting with the federal criminal defense attorney and asking him or her about their experience and track record in federal defense field including trial experience. Attorneys without trial experience are more likely to simply plead you out and may not be as willing to fight for you as experienced trial attorneys. Not all cases end up going to trial but having trial experience is important in negotiating best plea bargains. That is why finding a criminal lawyer is a no easy task. If you or your loved ones face federal criminal charges in New York, you need a solid and competent representation, the kind you will get from federal lawyers at Joseph Potashnik and Associates. Some of our New York City criminal attorneys have been practicing federal criminal defense for over 30 years, handling thousands of cases and taking more than a hundred cases to jury trials. Our federal criminal attorneys have over 75 years of combined criminal defense experience and we are one phone call away. When you need help, call our NYC criminal lawyers today at (212) 577-6677 to set up a confidential consultation.